A group of divers made a disturbing discovery last week while exploring near the remote island of Kokoya, in Indonesia. There, trapped inside cages on the shallow ocean floor, were two dugongs — rare marine mammals closely related to manatees. One of the divers, Delon Lim, told that the animals, also known as "sea cows," appeared to be a mother and her calf held in separate cages. While the younger dugong was kept without restraint, the adult was bound by a rope wrapped around her tail. The pair had been captured by a local fisherman, apparently to profit from tourists. 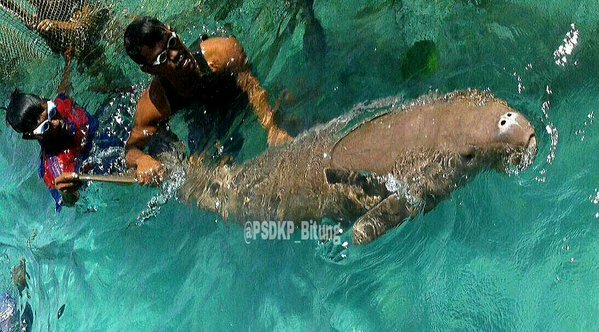 "He asked for some money if we want to see the dugong or take a picture," Lim said. Although it's unclear how long the dugongs were held captive, Lim suspects they'd been trapped for more than several weeks. "It seems so," he said. "The ropes are worn and torn. The scars and the wound on her tail are so deep. It was very heartbreaking." 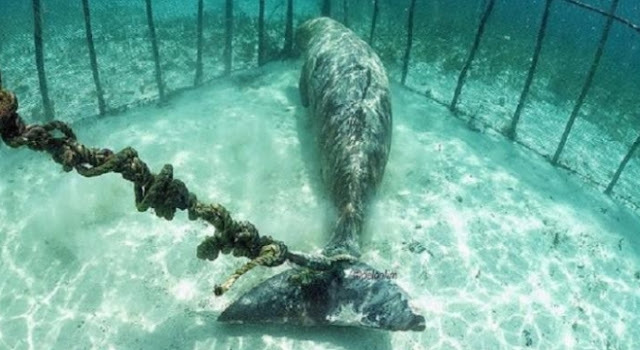 The divers were allowed to enter the cages with the adult dugong, capturing photos and video of her unimaginable ordeal.Not wanting the animals to continue suffering in that sad state, the divers tried to convince their captor to set them free, informing him that dugongs are a protected species vulnerable to extinction. And it's a good thing that they did. Within hours, Lim was contacted by wildlife authorities requesting the location of the cages. The next day, officials descended on the spot and found the animals still trapped. That's when they were finally set free. Responses to "Rare animals imprisoned in cages in the ocean are saved thanks to Facebook"
splendid! i hope they have stiff penalties for the capture and harm they'd done. I find myself saying, once again, how horrible human beings can be. And how wonderful they can be as well. It would be a different world if the latter were more true than the former. Bravo to the divers who helped free these animals. Glad there are conscientious people in this world. The culprits should be punished. Never ceases to amaze me how barbaric the human race can be.. Glad they have been set free now. Heartbreaking. Thank god for people who get involved and do something when they see a great injustice. Thanks to FB! And all involved. those animals would die if they were not permitted to come up for air. Sheryle: Shallow water means they could get air. We are quick to critic any use of animals for profit, unless of course it is to eat. [beef,chicken,fish] But you have to remember most of these people have no money at all. I know it is cruel, but I sure wish all of us could make a bit of money without resorting to such cruelness. Unfortunately that will never happen, especially when most countries have greedy governments, including the USA.